Founded by Dr. M.F. Keller in 1932. Dr. Donald M. Hager was born and raised in small-town Central Illinois. He graduated from the University of Illinois in 2003 and went on to earn his O.D. from Illinois College of Optometry in 2007. He practiced in multiple locales before deciding to settle with his family in Great Falls. Dr. Hager is a member of Great Falls Christian Center. He is a member of both the American Optometric Association and the Montana Optometric Association. He has trained and practiced at Malmstrom AFB in Great Falls, MT; the VA Medical Center in Amarillo, TX; and at a high-volume advanced care practice in Atlanta, GA. He also trained in low vision and vision therapy at the Illinois Eye Institute in Chicago, IL. Dr. Abby Thompson was born and raised in Deadwood, South Dakota. She graduated from Montana State University Bozeman in 2005 with a degree in Spanish. She attended Pennsylvania College of Optometry in Philadelphia and graduated with high honors in 2011. She completed the Baltimore VA Ocular Disease Residency program in June of 2012. 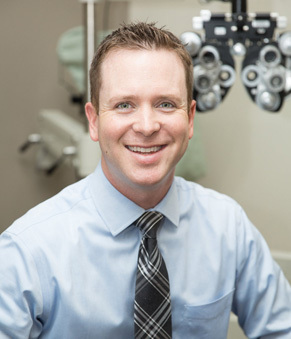 Dr. Thompson is currently a member of the Montana Optometric Association and American Optometric Association. Before returning to Montana she worked for a private practice in the Washington D.C area. She has had the opportunity to train with a corneal and contact lens specialist, as well as help those who have fought for our country at the Walter Reed Medical Center and the Baltimore VA.
Dr. Thompson, her husband and their son Walter are 100% outdoor enthusiasts. They enjoy mountain biking, hiking, running, rock climbing, hunting, snowboarding, and everything else the great outdoors of Montana has to offer. Dr. Josh Hager is from a small town in the Central Texas Hill Country. He graduated from Texas A&M University in 2004 with a degree in Biomedical Science. He then attended University of Houston College of Optometry and graduated with honors in 2012. He fulfilled his goal to serve his country by commissioning into the United States Air Force. His first assignment brought him to Montana where he met his wife Lindsay and fell in love with Big Sky Country. Dr. Hager is currently a member of the Montana Optometric Association, Beta Sigma Kappa Optometric Honor Society and the American Optometric Association. Practicing in the Air Force provided him a unique experience in aerospace vision, refractive surgery co-management, and vision conservation. He has special interests in complex contact-lens fitting, ocular disease, and dry eye. Dr. Hager and his wife Lindsay have two sons; Eli and Fate. When they aren’t enjoying a cup of coffee, they are usually found on the river or in the mountains. The whole family enjoys backpacking, fishing, kayaking and all the great outdoor adventures Montana has to offer.